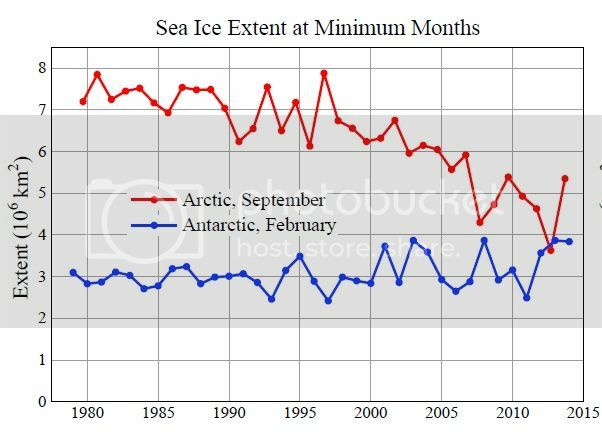 Walt Meier, formerly of the National Snow and Ice Data Center and currently of NASA’s Goddard Institute for Space Studies, has previously said that Antarctic sea ice, which has little ice that survives year to year, is less significant than Arctic sea ice to the climate system. The new Antarctic record anomaly was more than 10 percent greater than the previous record. The steady growth of Antarctic sea ice and its influence on global sea ice appeared to provide a public relations problem, at a minimum, for those warning of global warming’s menace. According to Meier and some other climatologists, global sea ice area is simply not a metric to consider when examining the climate system. “A plot of global sea ice is just not informative or useful,” Meier said. Global sea ice, during the course of the last year and a half, has seen its most robust 18-month period of the last 13 years, maintaining, on average, a positive anomaly for an 18-month period for the first time since 2001. Phil Jones, of the Climatic Research Unit at the University of East Anglia, waded into the global sea ice analysis in 2013 as well. “Adding the Arctic and Antarctic sea ice extents doesn’t make that much sense as the two regions are at opposite ends of the world, and the seasons are opposite,” Jones said at the time. As I also reported in Don’t Sell Your Coat, the temperature at the South Pole has been declining during the past four decades as well. 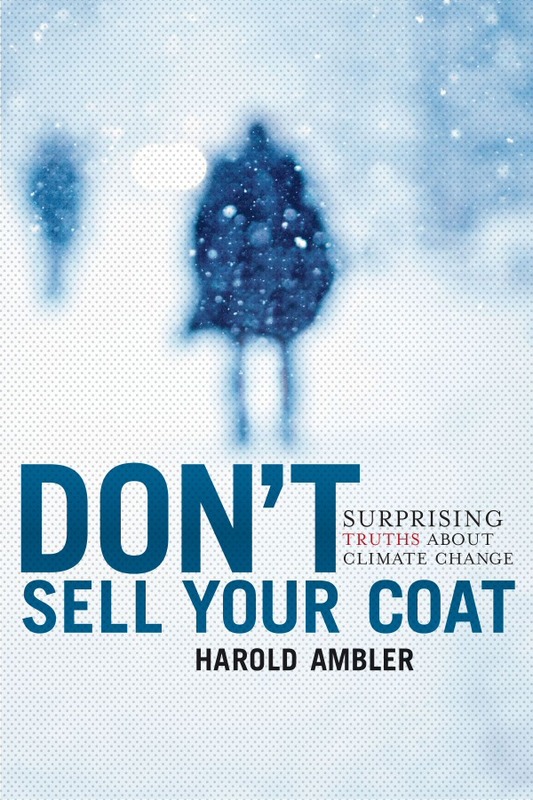 This entry was posted in Antarctic sea ice, Climate change, computer models, don't sell your coat, global warming, harold ambler, sea ice, walt meier and tagged antarctic sea ice, computer models, global cooling, global warming, Phil Jones, sea ice, walt meier. Bookmark the permalink. Given the different geographies at either pole I would expect the Antarctic ice to be a better proxy for world temps than Arctic ice. Not that either ice extent is a good proxy. E.g. sea ice extent is affected by wind more than air temp. That’s why warmists prefer all these proxies to the actual thermometer temps, when it suits their aims. To keep grants flowing, you can’t win with pseudo scientists: Ice cap shrinking ? It’s global warming – Ice cap growing? It’s global warming. 99 out of 100 physicians recommend a life saving operation and you want the opinion of # 100? Your analogy doesn’t hold water! Maybe 99 quacks and one world acclaimed surgeon, would be more correct. That has to be the most quoted false figure ever. Let see, Mr. Ambler quotes STATISTICS and Michael quotes a talking point. So Science is dead to talking points? Michael, that statistic you quote comes from a commissioned study/report/opinion request that was sent to the ‘Scientific Community’. I will paraphrase, OF THE # of respondents (Say 50 of 200 sent out responded) OF THOSE THAT RESPONDED 85% SAY GLOBAL WARMING IS A PROBLEM. My numbers and stats are for discussion and not to be quoted, actual data can be acquired. To include ALL scientists in your statement shows a true bias not based in science. If one was to look at the respondents I would be amazed to find that none of them had a financial incentive to promoting the THEORY of MAN MADE global warming. Michael, the earth’s temp has not gone up in like 12 years now. FACT. The amount of CO2 going into the atmosphere over that time period? WAY UP!!! FACT! Due to China, India etc.. You see Michael your arguments are based on models. Models are man made data input. At this point in this debate, basically ALL of the models are dead. Please bring back science before we re-enter the dark ages. only if the 99 has be order to give that recommendation by the AMA, then you have to question it. If 99 physicians, all of whom have been giving consistently wrong prognosis for decades, recommend an operation for me, then yes, I absolutely want a 100th opinion! Since this story is being disseminated to the masses it would be nice if the actual areal quantity of ice was given vs just the anomalies. It is a bit confusing. Sea Ice AREA “anomaly” set a record recently. Sea Ice EXTENT “anomaly” did not. NSIDC reports EXTENT. Cryosphere reports AREA. Sea Ice Extent total set an all time record in 2012 and then again on September 30 2013 when it hit 19.57892 million sq km. But it is if it’s shrinking. Realize that when light returns to the southern ocean, the world is replacing 80% sunlight absorbing ocean with 70% reflecting ice/snow, and that the reflection is at wavelengths that CO2 cannot intercept and re-radiate. Guess where global temperatures will be headed!!! I have been trying to make people understand what the ever increasing amount of Antarctic sea ice could mean. People simply refuse to listen when you tell them that if the trend continues, it could very well tip the scales against us and cause the Earth to move into a period of glaciation. One thing is for sure, if that happens, we wont have to worry about sea levels rising because sea levels around the planet will fall by hundreds of feet as more and more water is locked up in glaciers around the world. A thin film of ice spreading out over the southern ocean does not mean the poles aren’t melting. 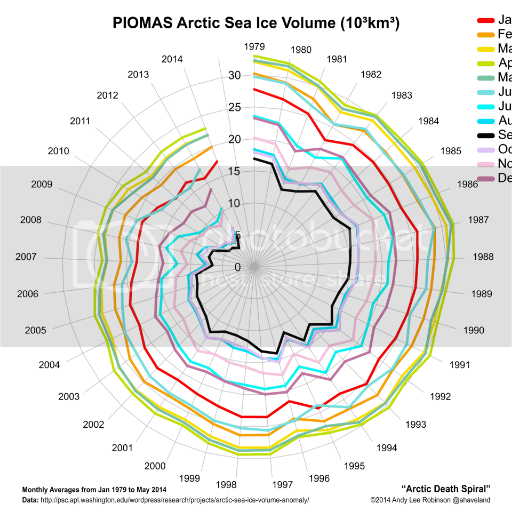 Without a doubt, global ice VOLUME AND MASS are decreasing globally; at an increasing rate on both poles. This article cites surface area, not nearly as important an indicator. Look at it this way: You have a 10′ deep pond in your back yard with a spring feeding it. One day in the dead of winter when its wicked cold 80% of the pond is frozen solid down to the bottom. The side of the pond fed by the spring is still liquid and so is the surface above it. As spring comes the whole pond thaws but overnight the surface freezes an inch thick. Which is “more ice” the whole surface frozen an inch thick in the spring or an 10′ deep pond that’s 80% frozen solid by volume in the winter? Arctic ice is not land based and fluctuates a great deal depending on local weather, water temps, wind and a great many other variables. Nobody is saying that arctic sea ice volume hasn’t gone down, what they are saying is that so far the gloom and doom predictions that the arctic would be ice free during the summer months has failed to happen the many times it has been predicted, with the ice free 2014 summer prediction by Al Gore being the latest in a long line of failed predictions on the issue. Antarctic ice mass has not decreased by 50%, Antarctic ice volume has not decreased by 50%! You need to stop reposting BS from sources like the one you cited and go directly to the measurements. Had you done that you would see that in spite of the apocalyptic flooding predictions Antarctic ice has remained pretty much unchanged. While the glaciers that feed off of the western ice sheet are retreating rapidly, we know thanks to some brilliant work by geologists that the retreat isn’t being caused by man made global warming like was reported for months earlier this year, but by melting from volcanoes. if you look at the actual ice data you will see that the eastern ice sheet has been growing rather rapidly and while the western ice sheet is growing, that growth is being offset by the rapid retreat of the glaciers that feed off of it. Plus, if the antarctic ice volume had decreased by 50% like you suggested, the water from all of that melted ice would have increased sea level by well over 150 feet! Since that hasn’t happened, I feel safe calling you a clown for not checking the real ice data versus something some nobody posted on a political losers forum. Here is a newer one to the other graph. Why do you prefer the outdated graph to the following updated one? If you could just explain why you have used these illegitimate tactics. In particular, do you deliberately intend to mislead, or are you simply mislead yourself? As one can clearly see the ocean waters around Antarctica are mostly below normal not above normal. There has been no warming around Antarctica. This article is a bunch of nonsense. Data does not lie. If you want to discuss the “amount” of sea ice, you want to know its volume (or mass), not its area (or extent). Yes, the Antarctic SIE is increasing, and global SIE is back near levels of the late-80s/early-90s, though the long-term trend is still very much downward. 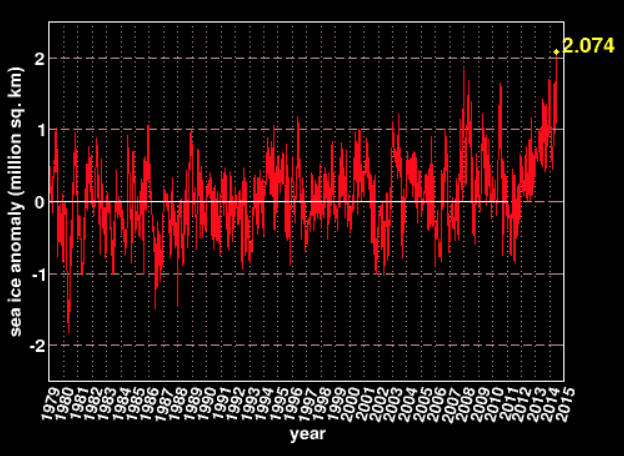 But the volume of sea ice is not increasing, it’s decreasing. When it comes to climate sea ice area extent is what matters. If you want to look at the consequences of heat gain, ice volume is what matters. Now they are trying to use the ice volume argument which does not hold water as a climatic factor in comparison to sea ice area coverage. Albedo is effected much more by coverage not thickness. 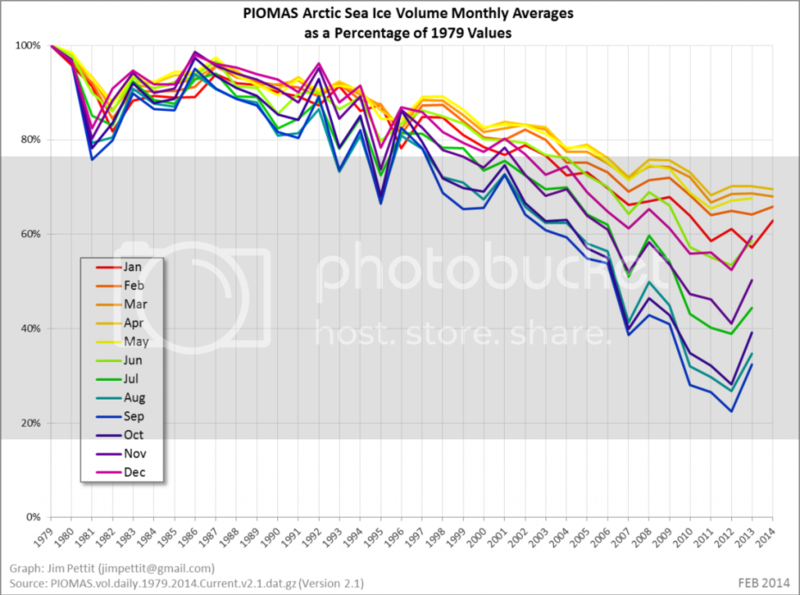 In addition with a sea ice anomaly of over 2 million sq km in Antarctica I highly doubt sea ice volume has decreased. It depends on what you are talking about. If it’s albedo effects, the area matters. If it’s heat changes, then you need to talk about volume or mass. I didn’t say sea ice volume was decreasing in the Antarctic — in fact, I said the opposite. Read my link. Sure David while Antarctica temperatures have shown no warming for years. It is not a “falsehood,” Salvatore. I gave all the sources in my link. They are peer reviewed studies in major journals. You don’t get to dismss facts just because you find them inconvenient — that’s not how science is done. Meanwhile, both GISS surface and UAH satellite datasets show the Antarctic has been much colder than usual recently. note ANTARCTICA is colder then normal. UAH doens’t — it shows that the SoPol 10-yr moving average has changed by +0.19 C in 10 years. It’s trend since the dataset began in 1979 is 0, however. Please reply if you find any flaw in the following data. This is what happened in the Arctic during the ‘global warming pause’. This is what happened in Antarctica during the ‘global warming pause’. ABSTRACT: “We use monthly measurements of time-variable gravity from the GRACE (Gravity Recovery and Climate Experiment) satellite gravity mission to determine the ice mass-loss for the Greenland and Antarctic Ice Sheets during the period between April 2002 and February 2009. In Greenland, the mass loss increased from 137 Gt/yr in 2002–2003 to 286 Gt/yr in 2007–2009, i.e., an acceleration of −30 ± 11 Gt/yr2 in 2002–2009. In Antarctica the mass loss increased from 104 Gt/yr in 2002–2006 to 246 Gt/yr in 2006–2009, i.e., an acceleration of −26 ± 14 Gt/yr2 in 2002–2009. And I find that a quadratic fit to the PIOMAS monthly data on Arctic sea ice extent gives a acceleration of -16 +/- 2 Gt/yr2 since 1979. Temperatures are averaging below normal in ANTARCTICA which means they are well below freezing, the ice is not going anywhere. In the Arctic summer temp. have been averaging below normal which is far more important as to how much ice loss may occur then winter temperatures which are well below freezing regardless if the average temp. in winter is above below or just normal. So the loss of ice mass is an empty argument at best. Arctic sea ice extent is 4.4% lower than this time last year. Over their entire datasets, starting in 1979, Arctic SIE’s trend is -53,300 km2/yr. The Antarctic’s is +19,400 km2/yr. 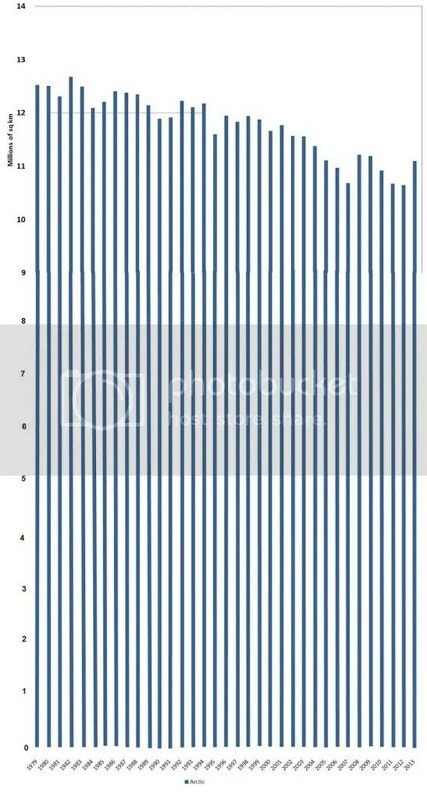 David what matters for ice loss in the end are the number of days the temperature is above 32 not if the temperature is warmer then average.